For the first time since 2005 and for the fifth time in his historic career, Tiger Woods once again sits atop the Augusta National throne. Big Cat emerged victorious on Sunday at the Masters, sending the entire sports world into a frenzy -- and come Monday, one smart bettor will be laughing all the way to the bank as a result of the victory. "It's great to see Tiger back," Bogdanovich said. "It's a painful day for William Hill -- our biggest loss ever -- but a great day for golf." "I thought it was probably an $85 or $8,500 bet," said Bogdanovich at the time. "But they were for real." 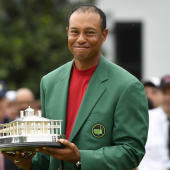 They were indeed for real, and because of the hefty risk that was taken, someone holds a ticket that makes them more than $1 million richer thanks to Woods announcing to the world that he's not going anywhere on Sunday.